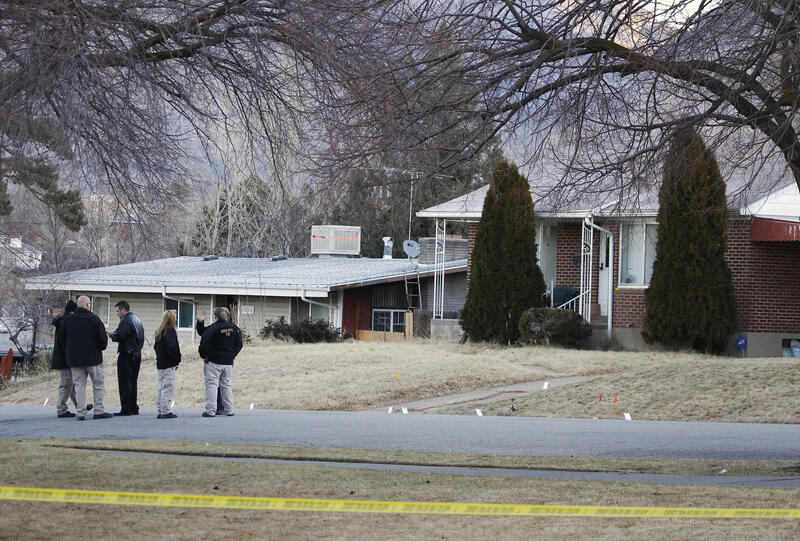 Investigators stand next to evidence markers in front of the house of Matthew Stewart, who was shot and injured by Ogden police during a drug raid, in Ogden, Utah, Jan. 5, 2012. One police officer was killed and five were wounded in the shootout that erupted as a narcotics enforcement team executed a search warrant at Stewart's home. Sgt. 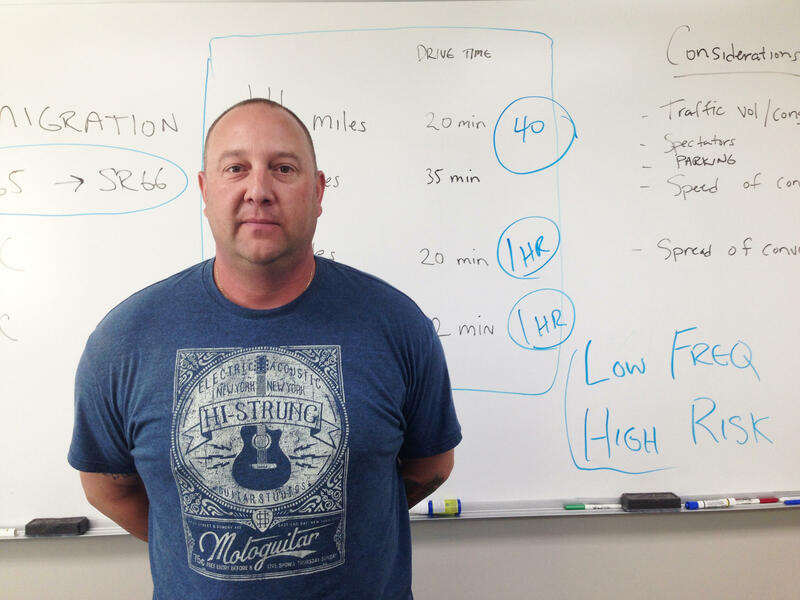 Jason Mudrock, a veteran SWAT officer with the Unified Police of Greater Salt Lake. State Sen. Mark Madsen, in his office at the Utah State Capitol. A Republican with a libertarian bent, he sees excessive use of police tactical teams as a threat to personal freedoms. 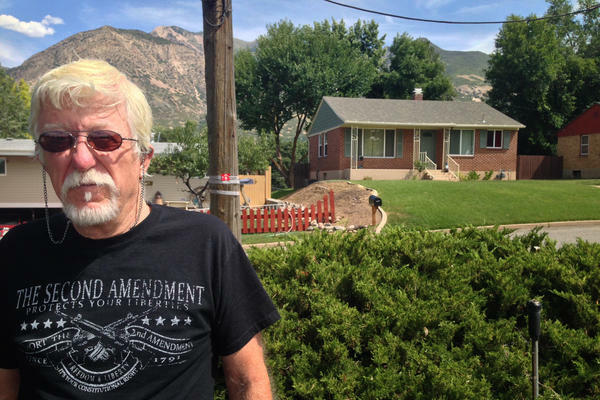 Michael Stewart stands across the street from the house where his late son Matthew David Stewart used to live in Ogden, Utah. It was raided by the local drug task force in January 2012, and an agent died in the crossfire, igniting a statewide controversy over the use of police tactical teams in drug cases. The pressure to start counting the operations there dates back to 2012, after a drug raid gone wrong in Ogden. A tactical team from the local drug task force had gone into a little house where marijuana was being grown. But they ran into gunfire. In the chaos, five officers were hurt, and one was killed. The resident, Matthew Stewart, later said he thought he was being robbed. Three-and-a-half years later, his father, Michael Stewart, dressed in a Second Amendment-themed T-shirt, sits across from the house, recalling the aftermath. "There were bullets in the house next door," he says. "These guys were — they were just shooting. I mean, this neighborhood has children. Why would they be that out of control?" The raid caused intense arguments in Utah: Did the agents give Matthew Stewart enough time to answer the door? Did he know the intruders were police? Those questions were never answered in court, because Stewart died in jail, apparently a suicide. But there was still a chance to answer some deeper questions, such as how often police use these tactics, and for what purposes. In 2014, Utah's Legislature required police agencies to start reporting some basic statistics on tactical deployments. The first year's numbers came out recently. State Sen. Mark Madsen, the chairman of the Judiciary, Law Enforcement and Criminal Justice Committee, says the numbers are interesting — but not that surprising. He's especially interested in the breakdown of the reasons for the 559 times tactical teams were deployed in 2014. "Active shooter, barricaded suspect — these are less than a percent," Madsen says. And then he points to the single biggest portion of that same breakdown: 78 percent of deployments were for cases involving illegal drugs. "This is mostly about drugs. Mostly about drugs," he says. This annoys Madsen, because he's a Republican with a strong libertarian bent, and he sees drug raids as cases of government run amok. "They're telling us what pursuit of happiness is legal and what pursuit of happiness will cause our door to be kicked down and to be dragged off to prison," he says. In Utah, Libertarian-minded Republicans have joined the minority Democrats on this issue, putting law enforcement agencies on the defensive in a way they're not used to. Feeling the criticism, some tactical officers are eager to draw distinctions. "I think part of the problem is in the definition of what we're calling SWAT and what we're calling tactical teams," says Jason Mudrock, a sergeant with the Unified Police of Greater Salt Lake. He says you shouldn't confuse SWAT with other kinds of heavily armed police tactical groups, such as drug task forces. He says his SWAT team isn't in the business of barging into houses unless there's a clear danger. "This is the biggest stick in the agency, and we don't use that stick unless we can quantify it somehow with either weapons history, statements made by suspects, availability of weapons," Mudrock says. "All these different factors that we take into account prior to us even saying, 'OK, we're going to take this operation on and deploy it.' "
In private, SWAT officers often criticize the drug task forces, which proliferated in the 1980s and '90s. SWAT officers don't like how the task forces seem focused on taking suspects by surprise in order to keep them from destroying the evidence. SWAT officers say the tactics should be about protecting lives not evidence. But Mudrock admits all tactical police are feeling pressure to up their standards. "We've had some of these blurred lines over the years, and I agree with the legislation, in that we're trying to professionalize this a little bit and make it more standardized," he says. Besides requiring numbers, the Utah Legislature has tightened the rules. Officers have to wear clearly marked uniforms, and body cameras if they have them. And the law now clarifies that simple possession or use of illegal drugs isn't enough to justify police breaking down your door. On the receiving end of this kind of legislation is Troy Burnett. NPR interviewed him at a diner in Ogden. That's because he's on a drug task force, and the office location is supposed to stay secret. In fact, he's on the Weber-Morgan Narcotics Strike Force — the same task force that raided Matthew Stewart's house in 2012. "I lost a friend. And a lot of my other friends were hurt. And I thought it was just so unnecessary," Burnett says. He wasn't on the task force at the time of the raid, but he's convinced Matthew Stewart knew he was shooting at police. Burnett rejects the suggestion that drug task forces are reckless, and he says he doesn't mind that the state is now keeping track of operations. But he also says the debate over tactical operations has been tangled up with a very different question: whether drugs like marijuana should be illegal. "Marijuana legal or not legal — I don't give two [expletive]," Burnett says. "I have my own opinion, but as long as it's illegal, I'm going to enforce the law," he says. And he says enforcing the law sometimes means serving warrants with tactical methods. "We're law enforcement officers. It's on the books. We're supposed to do this," Burnett says. Many of the people who want to count police tactical operations also want to decriminalize drugs. Chief among them is Connor Boyack, who runs a local libertarian advocacy group called Libertas. And in his efforts, he says, collecting data is key. "Imagine if we as taxpayers allowed the government to tax and spend on whatever it wanted without tracking that information," Boyack says. "There would be no accountability, and there would be every incentive for abuse. As it pertains to law enforcement, we've allowed for the same incentive without tracking and measuring this exact information." But numbers aren't everything. Sometimes they have a way of being ignored. As it turns out, Utah is not the first state to count tactical operations. Maryland passed a similar law in 2010, after a botched raid there. But three years later, the law lapsed after legislators reportedly forgot to renew it. Boyack says he doesn't expect attention to wane the same way in Utah. He says the first year's report is just the beginning — a baseline. And he looks forward to comparing Utah's numbers with those of other states, if they follow suit. The expression police militarization conjures up images of cops in Kevlar, barging into homes with semi-automatic weapons. Familiar as that image might be, we don't know how often it really happens because there are no good statistics on police tactical operations in America. The federal government does not keep track, neither do the states - with one exception. NPR's Martin Kaste reports on why Utah decided it needed more information. MARTIN KASTE, BYLINE: The pressure to start counting these tactical operations in Utah started to build back in 2012 after a drug raid gone wrong in Ogden. KASTE: That's dashcam video from a backup police car arriving at the scene. A tactical team from the local drug task force had gone into a little house where marijuana was being grown, but they ran into gunfire and an officer was killed. The resident, Matthew Stewart, later said that he thought he was being robbed. Three and a half years later, his father, Michael Stewart, sits in a car in a church parking lot across from the house, recalling the aftermath. MICHAEL STEWART: There were bullets in the house next door. These guys were - they were just shooting, you know? I mean, this neighborhood has children. You know, why would they be that out of control? KASTE: The raid caused intense arguments in Utah. Did the agents give Matthew Stewart enough time to answer the door? Did he know that the intruders were police? Those questions were never answered in court because Stewart died in jail, apparently a suicide. But deeper questions - questions about how often the police use these tactics and why - those questions maybe could be answered. So last year, Utah's legislature told police agencies to start tracking their deployment of tactical groups. The first numbers came out a couple of weeks ago. State Sen. Mark Madsen is in his office at the Capitol, and he's looking at the breakdown of the reasons for tactical operations. MARK MADSEN: Active shooter, barricaded suspect - these are less than a percent. KASTE: Madsen's the chairman of the Judiciary and Law Enforcement Committee, and he's long suspected that high drama operations, such as hostage situations, were actually only a small percentage of the total. Now these numbers confirm that suspicion. MADSEN: Yeah - drugs. It's just - this is mostly about drugs, mostly about drugs, yeah - and with very few weapons around, apparently. KASTE: It's about drugs almost 80 percent of the time. This annoys Madsen because he's a Republican with a strong libertarian bend. And he sees these drug raids as a case of government run amok. 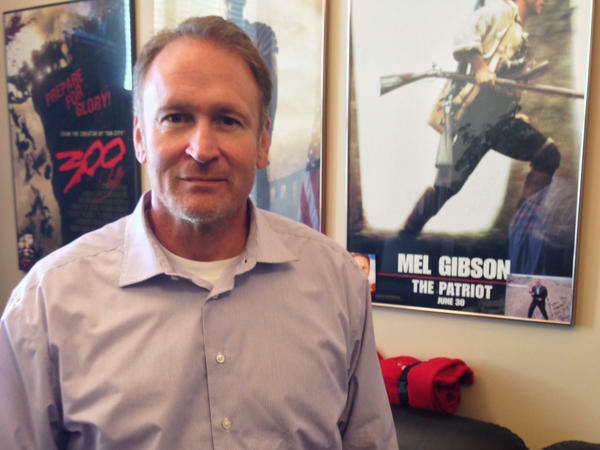 MADSEN: They are managing our lives. They're telling us what we can and can't do. They're telling us what pursuit of happiness is legal and what pursuit of happiness will cause our door to be kicked down and to be dragged off to prison. KASTE: In Utah, libertarian-minded Republicans have joined the minority Democrats on this issue, putting Utah's law enforcement agencies on the defensive in a way that they're not used to. JASON MUDROCK: I think part of the problem is in the definition of what we're calling SWAT and what we're calling tactical teams. KASTE: Jason Mudrock is SWAT. He's a sergeant with the Unified Police of Greater Salt Lake. He says you shouldn't confuse SWAT with other kinds of heavily armed police tactical groups, such as drug task forces. They may look and sound the same, but he says his SWAT team is not in the business of barging into houses unless there's a clear danger. MUDROCK: This is the biggest stick in the agency, and we don't use that stick unless we can quantify it somehow with either weapons history, statements made by suspects, availability to weapons. All these different factors that we take into account prior to us even saying OK, we're going to take this operation on and deploy it. KASTE: And private SWAT officers often criticize the drug task forces, which proliferated in the '80s and '90s. They don't like how the task forces seem focused on taking suspects by surprise so they can keep them from flushing the drugs. SWAT officers say the tactics should be about protecting lives, not evidence. But Mudrock admits that all tactical police are now feeling pressure. MUDROCK: We've had some of these blurred lines over the years. And I agree with the legislation on that we're trying to professionalize this a little bit and make it more standardized. KASTE: Besides requiring numbers, the Utah legislature has also tightened the rules. Officers have to wear clearly marked uniforms and body cameras if they have them. And the law now clarifies that simple possession or use of illegal drugs is not enough to justify the police breaking down your door. On the receiving end of this kind of legislation is Troy Burnett, sitting in a diner in Ogden. He does the interview here because he's on a drug task force and the office location is supposed to stay secret. In fact, he's on the Weber-Morgan Narcotics task force. That's the same task force that raided Matthew Stewart's house in 2012. TROY BURNETT: You know, it is what it is. I lost a friend out of that. I did. I lost a friend. And a lot of my other friends were hurt. And I thought it was just so unnecessary. KASTE: He wasn't on the task force at the time of the raid, but he's convinced that Matthew Stewart knew full well that he was shooting at police. Burnett rejects the suggestion that drug task forces are reckless, and he says he doesn't mind that the state is now keeping track of the operations. But he also believes that the debate over tactical operations has been tangled up with something very different - the question of whether drugs like marijuana should be illegal. BURNETT: Here's the thing. I don't care what the law is. You know, my job is to enforce it because I think that's what society expects me to do and that's my obligation. Look, we're law enforcement officers. It's on the books. We're supposed to do this. KASTE: And it's true that many of the people who want to count police tactical operations also want to decriminalize drugs. Chief among them is Connor Boyack, who runs a local libertarian advocacy group called Libertas. He says collecting this data is key. CONNOR BOYACK: Imagine if we as taxpayers allowed the government to tax and spend on whatever it wanted without tracking that information. There would be no accountability, and there would be every incentive for abuse. As it pertains to law enforcement, we've allowed for the same incentive without tracking and measuring this exact information. KASTE: But numbers aren't everything. Sometimes they have a way of being ignored. It turns out Utah is not the first state to count tactical operations. Maryland passed a similar law five years ago after a botched raid there. But then their law lapsed. Legislators reportedly forgot to renew it. Connor Boyack says he doesn't expect attention to wane the same way in Utah. The first year's report is just the beginning, he says, it's a baseline. And he looks forward to comparing Utah's numbers with those of other states, assuming they follow suit. Martin Kaste, NPR News, Salt Lake City. Transcript provided by NPR, Copyright NPR.